Theoretical and Aesthetic Approaches to Composition – a 2-Day Workshop with Zbigniew Karkowski :: November 2-3 ,2009 :: NK Elsenstr. 52 2HH 2Etage, Berlin :: Fee: 100 :: Number of participants is limited to 15 :: Register – enka_nk [at] gmx.de . 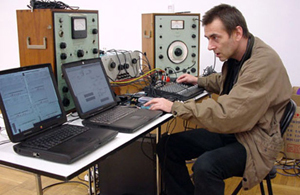 Born in Krakow, Poland, in 1958, Zbigniew Karkowski is one of the most significant artists working in the field of experimental and contemporary music. For the first time in Berlin, he will give a workshop for sound artists, musicians or composers who are interested in his approach to composition and live performance on both the technical and formal level. This workshop gives the participants an opportunity to gain insight into the working methods of one of the most challenging composers / performers of electronic music today. Karkowski will teach the participants about his aesthetic and conceptual approaches towards composition through an in depth analysis of some of his own pieces as well as exploring the compositional concepts that are inherent to the design of his Max and Super Collider patches. Along these lines aesthetic approaches towards the use of sound textures, timbres and the technical aspects of sound production will also be covered and finally he will share his experiences and ideological beliefs about live performance and composition. These years, he attended many summer composition master courses (Centre Acanthes in France) where he studied with Pierre Boulez, Iannis Xenakis, Olivier Messiaen, and Georges Aperghis. Based in Tokyo, Karkowski has a large collection of releases and regularly presents his work all over the world.